I once asked Pete if he thought a song could actually cause people to get up and take political action in their own lives outside of the concert hall. He said he didn’t know for sure. And as far as I know that correlation has never really been proven. So what is the power of song? Well, practically speaking it can bind people together with a shared emotional experience, its fun and its just something to do, an excuse to congregate and be together. But I think the point is that music making is just as integral and just as old a part of the human process as eating or speaking, its just less obviously important. Human beings are cultural animals who evolve to fit new habitats and circumstances not biologically (I guess we do in the very long term) but culturally. Eskimos can live in the arctic not because they’re very physically different from other peoples, they’ve just adapted culturally. And if we’re gonna speak against the war, and against other forms of oppression and inequality then we’d better sing about it too, that’s how humans will evolve and progress culturally. 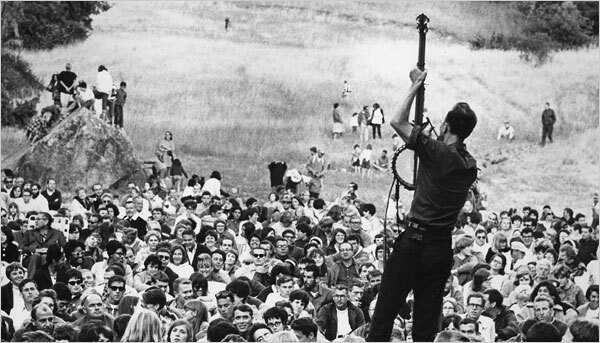 That’s what Pete Seeger is all about- evolving humanity in a positive way! A grand ambition, but a righteous one. Throughout the film you can see how Seeger’s magnetism and visionary temperament has in fact caused people to act in response to him in various ways. He actually is the Johnny Appleseed who really did sow the seeds of the modern political songs movement as well as the traditional folk song movement throughout the country. The film is very good in weaving the straight chronology of Seeger’s life together with some historical perspective, and personal accounts by Seeger himself as well as family, friends and other musicians. One of my favorite family parts was Pete with his brother John Seeger. The film is also very visually beautiful, and I particularly enjoyed the naturalistic element where Brown incorporates footage of the seasonal change around Seeger’s home in upstate New York on a hill overlooking the Hudson River. Spring, summer, fall, ending with winter and Pete’s own old age. This house and land are very central to the lives of Seeger and his family. They moved there in 1949 and camped out, built their own log cabin, hauled water, chopped wood and made a life and home there together on their own terms. There are some astounding moments in the film. I don’t want to ruin it so I’ll just tell one- There’s a lot of archival footage, such as Seeger’s press conference following his HUAC hearing in 1955. Where did they find that!? That was really interesting. When Pete was called before Congress to be Red-baited he took the 1st amendment, not the 5th, and it was just stunning to see what he said to the press directly after that hearing. There’s also awesome concert footage. Pete does not want to be a star- however the man has an off the charts level of talent, he’s a great singer, a great instrumentalist and just a great performer, and they really found some great footage of him playing. Pete has probably sung together with audiences of literally millions of different people thoughout his long career, and no doubt many of those shows were really amazing. Happily they managed to capture some of that spirit in the film. Originally Pete did not want this film to be completed until after his death. But things are real bad here in the USA now and getting worse, and I guess Pete wanted a way to address that. He’s very old now and can’t tour and play like he did for so many years, so he and Jim Brown and executive producer Toshi Seeger (Pete’s wife of 64 years) brought out the film now. This film brings Pete’s message once again to the American public through the remarkable story of his life. So feel free to sing during the screening of the film. The audience at the Tribeca film festival, myself included, definitely did. Whether you are a long time fan of Pete Seeger or are just becoming aware of of his work, this film is a must see. **The only criticism I have is that Down Home host Henrietta Yurchenco was not included in the final edit of the film. She was interviewed by Jim Brown for the film, but that footage was not ultimately used. Henrietta has known Pete since 1940 and was the first person to put him on the radio way back in that same year. She also worked with his father Charles Seeger. No one with her perspective was included in the film. This footage should be made available.